WASHINGTON — The District of Columbia witnessed a massive, public drug deal on Thursday — and for those involved, it was quite a bargain. With D.C. police officers looking on, hundreds of city residents lined up and then walked away from a restaurant carrying plastic baggies filled with marijuana seeds. Taking advantage of a ballot measure approved last fall by voters that legalized possession of the plant, the unprecedented giveaway scattered what organizers said were thousands of pot seeds to cultivate in homes and apartments across the nation’s capital. Depending on how many D.C. residents have green thumbs, a homegrown crop of pot could be ready for legal consumption by late summer. Washington is unique among the handful of states that have legalized pot for recreational use; under a prohibition by Congress, buying and selling marijuana remains against the law. That made Thursday’s giveaway — and not an opening of stores for legal sales, as has happened in Colorado and Washington state — the highest-profile event to date marking the reality of legalization. The line for the marijuana “seed share” at the Libertine bar and restaurant in Adams Morgan snaked down the street. It included people of many ages and ethnic backgrounds and from all corners of the city. Close to 8 p.m., it also featured a pouring rain. Wendell Myers didn’t want to to stand at the back of a line hundreds of people deep, but he had no other choice. He wanted marijuana seeds, and this was the only place he could legally snag some. Thanks to Congress, Washington also has no ability to track the seeds dispersed Thursday. That could begin to feed a gray market for bartering and other attempts to profit off legalization. In Colorado, every marijuana seedling raised for the commercial sale of pot is tracked with a 24-digit radio frequency identification tag. Sales are heavily taxed by the state, and the money goes mostly to education. In Washington, thousands of plants could soon begin growing with no such oversight or benefit to the city. Proponents of the ballot measure counter that a crop from amateur growers could increase supply and drive down the market for illegal street sales. Home growth was intended by the ballot measure, known as Initiative 71, which voters approved in November. The measure allowed for owning, growing, sharing and smoking (out of public view) marijuana. Each resident in Washington is allowed to cultivate six seedlings and up to three mature plants. The limit per household is 12 plants. Growing pot in publicly subsidized housing complexes remains illegal in the city under federal law. “Home growth is what 70 percent of voters approved,” said Adam Eidinger, head of the seed exchange’s sponsor, D.C. Cannabis Campaign. Near the entrance to Libertine, Eidinger on Thursday night was the marijuana maestro, wearing a red bandana and ushering inside a single-file line of grinning patrons with talk of the racial injustices in D.C. prisons that led him to spearhead the effort to legalize marijuana. Eidinger said he and about 50 people brought seeds to share. Thousands were divvied up by genetic strains in the days before the giveaway. In bags of 10 to 20 seeds each, the products were arrayed on tables on the bar’s second floor when doors opened at 5:30 p.m.
Todd Kingman, 22, brought thousands of seeds from his personal collection to give away. He wasn’t specific about how he obtained them, but said he collected them overtime and purchased at least some of them from online seed banks abroad. He already grows marijuana at his home near Adams Morgan and said he didn’t mind handing out the seeds free of charge. “I wanted to give someone else an opportunity to do what I do,” he said. A second giveaway is planned for Saturday at the cannabis campaign’s headquarters in Washington. Eidinger said 1,300 people in all had signed up to attend the two events. 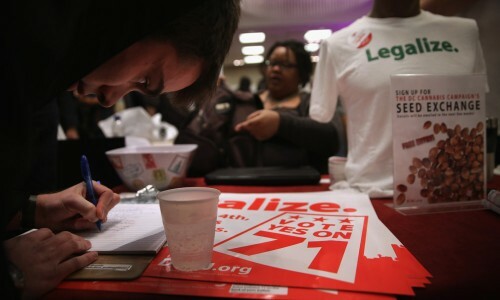 While the event marks the beginning of public use of Initiative 71, it also amounts to the curtain call for the successful campaign pushed by Eidinger and other hard-core advocates for marijuana legalization in Washington. Under city election laws, the campaign must disband this spring discontinue organizing public events. Eidinger said he wishes it could continue defending the law with critics. He said he plans to form a new community group to continue promoting safe marijuana use, and he will continue to press members of Congress to allow the city to set up a system to tax and regulate pot like other states. To register for Saturday’s event, click here. Topics: marijuana seeds, seeds, Washington D.C.